Newton-le-Willows, Merseyside [18th January 2019] – Speedy has announced a £10 million investment in new equipment and vehicles for its power generation business. The investment, which comprises over 250 generators, over 350 on-site fuel tanks and 15 fuel tankers, is part of an upgrade programme to provide customers with the latest, fuel efficient equipment. The generators are powered by Perkins Engines, primarily manufactured by Pramac and FG Wilson, and incorporate a broad range of node sizes from 20 kVA up to 500 kVA. 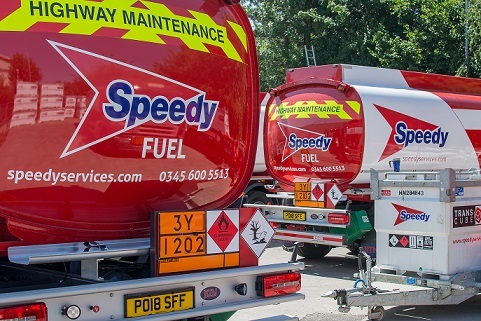 Once cleaned, the fuel can be delivered in the new fleet of IBC fuel tanks which, like the generators, are available to hire from Speedy power locations across the UK. These range from a 1,000-litre capacity to a 15,000-litre capacity tank. The investment is complemented by Speedy’s decision to renew its fuel tanker fleet and bring in 15 newly-designed and built tankers to deliver fuel to customer sites. Speedy’s power and fuel management capability is backed up by a technical sales support team and a team of engineers, whose capabilities range from general service and synchronisation, to end-to-end project management for power-critical applications. Together, these teams are able to support customers, making sure they are using the right generators and the right fuel to best serve their business needs. Added to this, Speedy engineers are able not only to install the new generators but also to synchronise them and therefore ensure that if the load changes, another will ‘kick-in’ automatically – a key benefit for power critical customers. This investment is an important step for Speedy to further to strengthen its fleet of power and fuel solutions. It ensures that Speedy’s customers will receive continuous, uninterrupted service and supply of power to meet their project and customer needs.